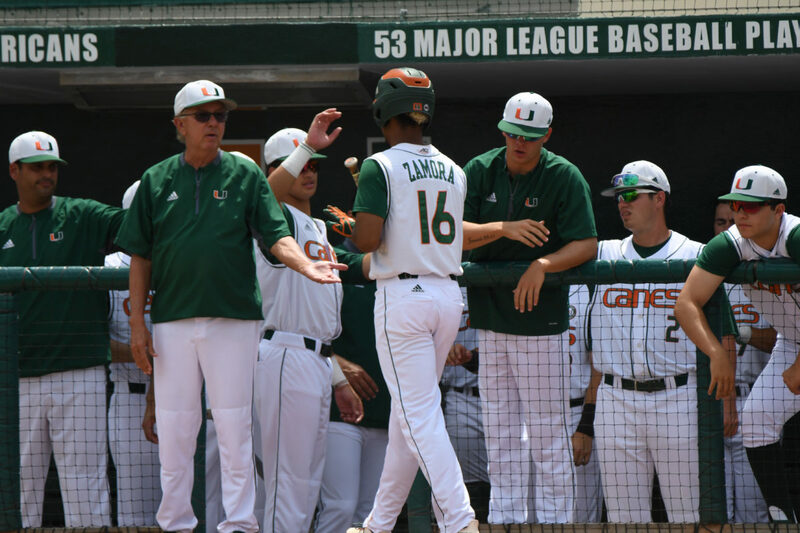 Coral Gables, FL – Lead: Through perseverance, grit and a whole lotta rain the Miami Hurricanes avoided the sweep and snapped a 7-game losing streak Sunday afternoon, outlasting the North Carolina Tar Heels 7-5 in a rain-shortened series finale. Andrew Cabezas (2-3 3.58 ERA) toed the rubber for UM, opposed by Rodney Hutchinson (3-1 5.18 ERA) to close the week. The Hurricanes got on the board first after Hunter Tackett hit a routine grounder to shortstop, Ike Freeman. Freeman botched the throw to first, resulting in an error, and a run scored as Willy Escala crossed safely. However, after a fantastic double play to put North Carolina on the brink of being retired in the second, Cabezas issued back to back walks followed by punishing back to back doubles, surrendering three runs to the Tar Heels. Miami had a golden opportunity in their half of the second after Hutchinson walked Tyler Paige to load the bases, ending his afternoon. He was replaced by freshman and NC native Caden O’ Brien. The Canes were poised to tie the game, or at the very least, score a run as O’Brien struggled to throw strikes. With a 2-0 count, Freddy Zamora swung at the pitch, lifting a high fly ball to shallow right for the second out in a glaring display of plate discipline, or lack thereof. Escala popped out as well to end the inning, squandering a chance at knotting up the game. It would haunt them until the fifth. Paige walks, but nothing more in the 4th for the Canes. UNC, meanwhile, extended its lead after Cabezas issued two straight walks, setting up a crippling 2-run triple by Brandon Riley to make it 5-1. Little did they know the baseball gods would intervene in inning number five, reminding the visitors what goes around comes around. Both Gabe Rivera and Tackett drew a walk, ending O’Brien’s tenure, replaced by another freshman named Joey Lancellotti. Romy Gonzalez greeted him with a hard liner to center, loading the bases for the big man, Michael Burns. Lancellotti got burned by Burns, launching a rocket over the head of Riley for a triple as payback between centerfielders to put Miami within one. Isaac Quinones followed up in the rally with a sac fly deep to left bringing Burns home, creating a brand new ballgame. And the inning still wasn’t over. Dylan Cloonan nailed down a two-bagger while Paige drew a walk, the final nail in Lancellotti’s coffin. UNC went deeper into the bullpen, turning to Brett Daniels. It wouldn’t make a difference. Zamora made it rain, literally, coming through with a bases-clearing double for a 7-5 lead as the raindrops started to fall. The grounds crew came out as the fans sought cover. Canes add 6 in the 5th to take a 7-5 lead! 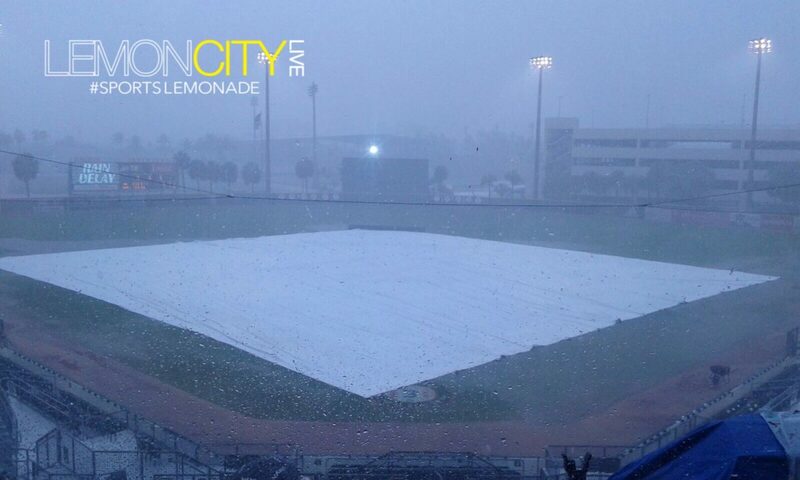 In true fashion of typical Miami weather, the tarp came off as quick as it went on as the brief 12-minute rain delay gave way to more baseball. And that’s when things got tense. At the top of the sixth, Ashton McGee singled up the middle while Freeman drew a walk. A passed ball moved up the runners, signaling a clear momentum shift. Cabezas recovered to retire the next two hitters but another wild pitch put North Carolina to within one run. Then the heavens opened up once more, sending down a deluge adding to the drama. Under the driving rain, Cabezas doubled down and struck out Cody Roberts to preserve the lead and the win in a rain-soaked seesaw match for the ages. Though this would ultimately prove null and void. The game was called after more than an hour-long rain delay, per ACC rules in the event of a rained out game the score reverts to the last complete inning, meaning the UNC rally and Cabezas’ heroics were erased. Miami improves to 13-18 (7-8 conf.) with a much-needed win as North Carolina falls to 21-11 (10-5 conf), their seven-game winning streak washed away. Freddy Zamora receives a hero’s welcome as he makes his way back to the dugout. 7-7-7, Miami finished the rain-shortened game with 7 runs on 7 hits leaving 7 on the base pads. The Tar Heels finished with five runs on six hits, stranding three. Freddy Zamora capped off an awesome weekend going 2-for-4 with 2 RBIs, including the game-winning 2-run double in the fifth. Michael Burns went 2-for-2 that included a double and a triple, collecting 3 RBIs along the way. Andrew Cabezas was credited with a complete game, officially going five innings giving up five runs on six hits while fanning four. Willy Escala’s nine-game hitting streak was snapped on Friday, going 0-for-5 as UM fell 8-4 in extras. Miami hosts the University of Central Florida on Wednesday, followed by a road trip to South Carolina to face ACC rival Clemson next weekend.